The fact that asbestos remains legal in the United States is a clear sign that not enough is being done to protect Americans from the dangers of asbestos exposure, but today the U.S. Congress took a step in the right direction. Led by Senator Jon Tester (D-MT) and Senators Daines (R-MT), Durbin (D-IL), Feinstein (D-CA), Isakson (R-GA), Leahy (D-VT), Markey (D-MA), Merkley (D-OR), and Warren (D-MA) as bipartisan co-sponsors, the Senate passed the 13th Annual Resolution establishing “National Asbestos Awareness Week” (S Res. 98). Each year, an estimated 15,000 Americans die each year from preventable asbestos-caused diseases, yet imports continue. Undoubtedly, the Resolution’s momentum and the forthcoming U.S. Surgeon General’s asbestos warning will raise awareness and save lives. These resolutions are so important, as they allow us to raise awareness at a national level — with some seriously credible backing, to boot — offering simple information about asbestos that everyone should know. The resolutions also help us engage Surgeon General to potentially take an official stance asbestos as well. Moreover, the passage of the resolution ensures that the 15 startling and irrefutable facts about asbestos will be entered into the Congressional record, archiving the evidence that the 115th Congress deems asbestos dangerous, deadly, and due for regulation. Now, more than ever, it’s crucial to raise asbestos awareness to ensure the American public understands that this is not an issue of the past. New data from the Center for Disease Control and Prevention (CDC) reports that asbestos-caused deaths are on the rise in the U.S., despite significantly decreased use since peak consumption in the 1970s. Further, the study reports that malignant mesothelioma deaths among patients aged 25–44 continue, indicating current and continued occupational, environmental, and secondary exposure risk. As the EPA begins its risk assessment of asbestos under TSCA, it is paramount that the Senate underscore what we’ve long known about asbestos — that it poses undue risk to human health and the environment and must be stringently regulated to avoid causing more harm. This has been the sentiment of the last 12 Senate Asbestos Awareness Resolutions as well as 5 warnings from the U.S. Surgeon General’s office, and just last summer President Barack Obama became the first sitting president to acknowledge asbestos as a deadly carcinogen. Especially with the onslaught of legislation aimed at eviscerating or limiting the powers of the EPA, this acknowledgement by the legislative branch sends a significant message. ADAO and asbestos victims across the country are enormously thankful to Senator Tester, Resolution co-sponsors, and the entire Senate for unanimously passing the 13th Annual ‘National Asbestos Awareness Week’ during April 1–7. 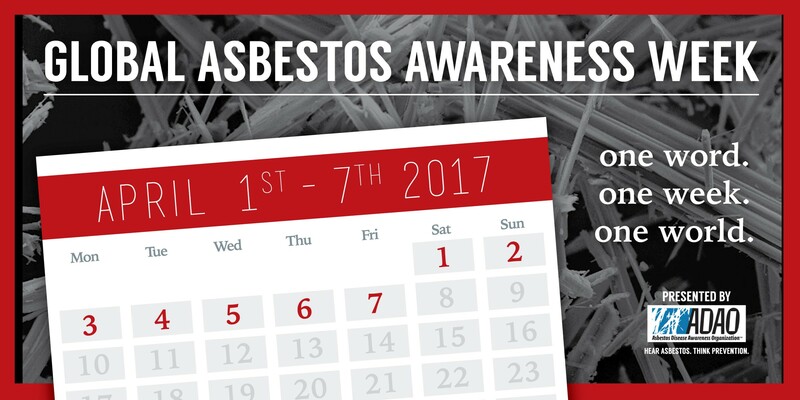 ADAO, along with our international partners, will be expanding the designated “National Asbestos Awareness Week,” to a worldwide Global Asbestos Awareness Week. During April 1–7, we’ll be sharing new, prevention-centric content each day. What’s more, thanks to our partnership with U.K. based public relations firm The McOnie Agency, our GAAW materials will be translated into six different languages for international distribution. As we continue to strive for stricter regulation of this known human carcinogen, prevention remains paramount to eliminating preventable asbestos-caused diseases — this is why campaigns such as GAAW and Less Cancer’s National Cancer Prevention Day are such crucial parts of the solution. Join the conversation on social media by using the hashtag #2017GAAW, and be part of the solution by sharing ADAO’s daily GAAW content with your communities — knowledge is power, especially when it can save lives!